Families looking to escape the British winter for some sporting action under sunny skies over February half-term can enjoy discounts of up to 20 per cent when staying at Spain’s five-star La Manga Club resort next month. Boasting world-class sports facilities and a climate averaging 300 days’ sunshine a year, the resort is the ideal destination for an active break and is offering an array of attractive savings for the school holidays – with five-night packages for a family of four in a two-bedroom apartment bookable from only €620 (approx £550). 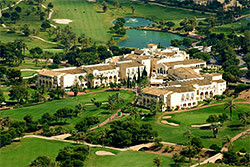 Bookable until January 31, 2019, the early-booking offer is available in both La Manga Club’s luxury Hotel Principe Felipe and four-star Las Lomas Village self-catering accommodation, with resort credit vouchers of €100 available for breaks of five to seven nights and €200 for stays of eight nights or more. And with so many savings on offer, guests will have even more money to spend on enjoying the venue’s array of sports amenities – including three 18-hole golf courses and an impressive golf training centre, a 28-court tennis centre and academy, cycling and 2,000sqm luxury Wellness Centre. All breaks include complimentary use of the fitness centre, indoor pool, saunas and steam rooms at the resort’s Wellness Centre, plus a free shuttle bus service. Situated in Murcia, south-east Spain, La Manga Club has set the benchmark for sports and leisure destinations across Europe for more than 45 years. The official overseas training base of the Lawn Tennis Association and named Europe’s Best Golf Venue at the 2018 World Golf Awards, the resort’s other facilities include a recently-opened European Cricket Performance Centre and more than 15 bars and restaurants. Founded in 1972, the resort now covers an area of 566 hectares containing accommodation, professional sports facilities, relaxation zones, first-class redevelopment and a private community of 2,300 residents, in a region which boasts more than 350 days’ of sun and is surrounded by natural parks and untouched beaches. High-resolution images of La Manga Club may be downloaded for editorial purposes from here.